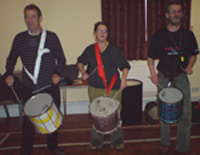 This workshop was organised by Sam Ware who invited groups from the region to participate in a one and a half day workshop culminating in a performance. Many members from Baixa, Sambassadors of Groove and Batatân attended the workshop. We worked on a fusion piece mixing elements from Cuban and Brazilian rhythms for the bateria. The piece was dedicated to the Yoruba God of the Oceans (Olokun) and combined elements taken from Cuban Bata drumming mixed with Samba Reggae from Brazil. The group worked very well together and on the Saturday, in only a few hours they learnt a piece that had two sections, some breaks and phrasing for Repiniques and Timbas. The evening concert consisted of separate performances from each group and everyone as a large ensemble presented the workshop piece.